EDIT 3/5/2014: We learned that the tactics explained in this blog post are a violation of Igniter Media’s terms of service and an infringement of their copyright. Ok. So many of you have seen the “Social Network Christmas” video. 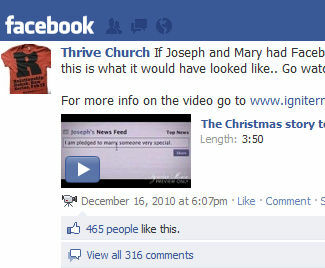 Basically it’s a video telling the nativity story if Joseph and Mary had Facebook. Very clever video made by Igniter Media. Well I am the Social Media director for Thrive Church (that’s a fancy title meaning I’m the volunteer that is most plugged into Facebook!). I took over the page in February of 2010 and we had about 245 “fans” at the time. Which for a church less than a year old and running about 200 on Sundays it wasn’t bad. I set out to do social media a bit different than most churches on Facebook. We don’t post sermon notes, scripture references and etc. Those things are great but they only build up the body and don’t give non fans (non Christians) any reason to “Like” our page. Our page had grown to about 1100 fans as of December 16th, not bad at all seeing as our average Sunday attendance was around 500. Well, I knew it would get shared alot but didn’t expect the astronomical results we got (If you want to see the full detailed results GO HERE). In a nutshell our page went from 1100 likes to just under 9000 likes in about a week’s time! I do alot of social media marketing and growth like this is unprecedented unless you’re spending $1000 per day on Facebook Ads. The video itself got over 465 likes and about 320 comments. Interestingly enough a debate raged on the video in the comments between Christians, Atheists and etc. I made sure it stayed clean but let them debate. Discussion is healthy and I wanted them to feel free to discuss things. The video as of right now has been viewed over 1.2 MILLION times via our page. 1.2 MILLION! Our page got 100s of thousands of hits and views and has changed the demographics of our page. Our average age has decreased and we now have a reach within our fan base of over 25 countries! Before we only had a few people even outside of Texas that had liked our page. All from 1 simple video posted once on our page.. THIS is powerful stuff people! Your church’s Facebook page (or any page for that matter) needs to be posting videos. And not just the links to the videos but the videos themselves. Take the time to upload them to your page. The free link back to your page when someone shares the video and a non fan see it is priceless. Still upload them to Youtube, Vimeo and etc but Facebook as well. Never before in the history of our society has a church been able to reach out to so many people in such a vast way as we can with Facebook. Harness this opportunity and leverage it. Every church wants to take the gospel around the globe but many think that means sending money to an offering that funds missionaries. That isn’t the case in today’s society. You CAN reach people around the globe using social media. Our challenge now at Thrive is to leverage our new fan base and find creative ways to engage them and find ways to minister to those in other countries and in to those that aren’t local to our church. With new ways on Facebook to target your posts we will be posting updates in other languages to make sure we minister to those in other countries. I also know that if I post everything on our page to simply “Everyone” we will lose Likes (We’ve seen a decrease of about 150 Likes since this all went down.). So if it is a post that is really just meant for our local congregation I make sure to target it to them, which is really easy to do. We have already seen results from the added Likes to our page. As far as we can tell so far at least 4 new families have found us for the first time because of seeing the video posted on a friend’s page! And a few of them have already joined our Growth Groups and are becoming a part of our church. And a few of them are people that either have never been to church or were completely disconnected from church and God until now! If this doesn’t get you excited check your pulse! Love God. Embrace Beauty. Live Life To The Fullest. To find out more about me, what I do, my quirks and my dedication/addiction to the Dallas Cowboys visit my personal blog. Paul. So grateful that you allowed me to post this on your site! My pleasure, Scott! Thanks for sharing this experience and insight with Christian Web Trends readers. Wow. I hadn't thought about this aspect of posting videos before. I weekly upload a video to youtube that we make ourselves, and then share it on facebook. It just made sense to me to upload it to one place and share it from there. I didn't even realize that I could have been building up our church page by uploading them directly to facebook. Thanks for the tip! Yeah when I realized this free link back to pages in videos I started uploading to Youtube and Facebook. You want the videos on YT because of the ability for people to search and find the subject. But the viral ability with videos posted onto a Facebook page is unlimited. Another reason I've always used Youtube and not Facebook for video was that Facebook didn't share viewing stats. It sounds like they do now, although the stats don't appear to be that involved. Youtube shows me where people are in the world who watch, how they found the video, and even how much of the video they watched. Has Facebook improved in this area at all? I think the insights for FB are great now. You can see where clicks came from and how many and etc.